Vagnsset med 3 sädestransportvagnar Tds typ NS, totallängd över buffertar 33,6 cm, epok V.
Type Tds Hopper Cars	Model: The cars are finely detailed, are painted blue, and have many separately applied details. The cars have separately applied chute extensions. The hinged roof can be opened. All of the cars have different car numbers. They are individually packaged. 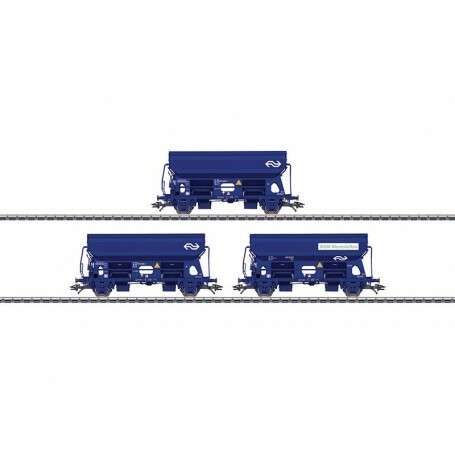 Length over the buffers per car approximately 11.2 cm / 4-3/8'. DC wheel set E700580. Prototype: Three Dutch State Railways (NS) type Tds hopper cars. Version with hinged load area roof cover. The cars look as they did in the mid-Nineties. Hinged roof covers can be opened.Car type ideal for unit train use.Very finely detailed construction.